Apple's in-house chip efforts could further prove this chipmaker's worth. In a recent column, I argued that Apple's (NASDAQ:AAPL) ability to develop its own chips is a "huge asset." The two key reasons I cited were the fact that Apple can build chips that allow it to differentiate its products from the pack, as well as the ability to more easily introduce new product categories. We've seen Apple's chip efforts at work across its current product lines, and the results have been good. In the coming years, Apple may bring its chip chops to bear as it tries to build its rumored Apple Car, according to analyst Ming-Chi Kuo with TF International Securities. Per the analyst, this could benefit key Apple supplier Taiwan Semiconductor Manufacturing Company (NYSE:TSM). Let's take a closer look at what Kuo (via MacRumors) had to say. In order for Apple to build its own self-driving car, it will need to either buy processors from others to handle the immense amount of computational power that's needed or build its own. From what Kuo writes, it seems that Apple is going to design its own chips -- as it does for almost all of its other product lines. While Apple has substantial in-house chip development chops, it doesn't manufacture its own chips. Instead, it relies on third parties to do that, as chip manufacturing is both research and development-intensive and capital-intensive. TSMC's opportunity would be its ability to profit from manufacturing those chips on Apple's behalf. It's important to keep in mind that at this point, trying to size the Apple Car opportunity for either Apple or TSMC is little more than a shot in the dark -- we simply don't have enough information to make predictions that have a prayer of being accurate. Nevertheless, if Apple does release its own self-driving car someday and it contains Apple-designed, TSMC-built silicon, TSMC would stand to profit. Whether or not Apple ultimately brings its own self-driving car to market, the key thing to keep in mind is the fact that Apple has an exceptional internal chip development organization, which makes it entirely feasible for the company to roll out its own self-driving car chips -- if it wants to, that is. Another thing to keep in mind is that a hypothetical Apple self-driving car chip could very well leverage many of the key technologies that the company already develops for its other product lines, such as the iPhone and iPad. 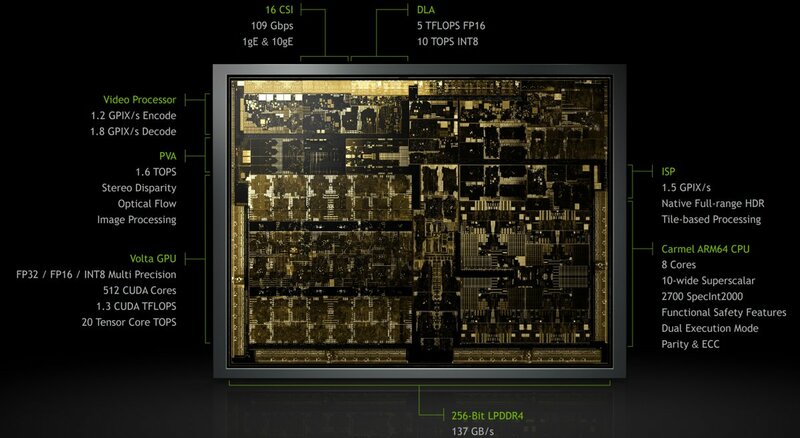 Take, for example, NVIDIA's Xavier chip, which is also targeted at autonomous vehicles. The chip incorporates CPU cores, a GPU, an image signal processor, a video processor, and a "programmable vision accelerator." Apple's A-series chips already incorporate many of those same basic technologies. It should be a relatively straightforward exercise for Apple to integrate those technologies -- albeit in different proportions suitable for the needs of future self-driving cars -- alongside any specialized technologies to support its ambition to build a capable self-driving car chip.